The Dri-Eaz Dragon 3600 Mobile Furnace is an indirect fired heater that comes with a 25' section of high temperature ducting. It supplies heated air to an area without adding any moisture or fumes through the heating process. The Dragon heater is able to do this by using a heat exchanger so that the process air never comes into direct contact with the flame in the combustion chamber. 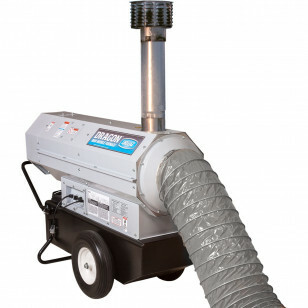 The clean, dry heat from the Dragon helps reduce drying times while maintaining stable and comfortable temperatures.It is the most ideal portable heater for water damage restoration, new construction drying, unheated job sites, temporary event shelters, and any situation calling for clean, dry heat. 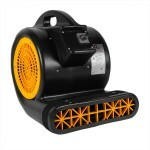 For applications like water damage restoration and new construction drying, the Dragon can increase drying efficiency. It can run continuously for up to 36 hours without having to refill its 13.5 gallon on-board fuel tank. Areas of a structure that can benefit from the addition of heat for drying include crawlspaces, basements, or parts of a building where heat is not available. Cold air actually impairs the evaporation of moisture from materials. Warm air from the Dragon helps our Dri-Eaz air movers, axial fans, and commercial dehumidifiers evaporate more moisture from materials and remove it from the structure. For instance, raising the temperature of an area with the Dragon by just 10°F (from 60°F to 70°F) can increase the evaporation potential of your existing drying system by up to 45 percent. No fumes, no added moisture when drying large areas. Up to 145° F increase in temperature on job sites. Thermostat with a 50ft remote sensor helps operators comply with “RIA Safe Harbor clause” and allows you to adjust the heat to your needs. 25' section of high temperature ducting included. Stainless steel combustion chamber and heat exchanger will not rust due to thermal cycling, moisture, or corrosive exhaust gasses. Up to 36 hours of uninterruped runtime without refueling. Included stack and rain cap keeps moisture out of the burner. This is a review for the Dri-Eaz® Dragon® 3600 Mobile Flood Restoration Furnace & Heater.